Did you have your costume ready for Halloween? The kids are very exited about it. As a lazy mom I first thought of using the same bat costume as last year, and the year before…but my kids clearly told me that was not gonna happen. 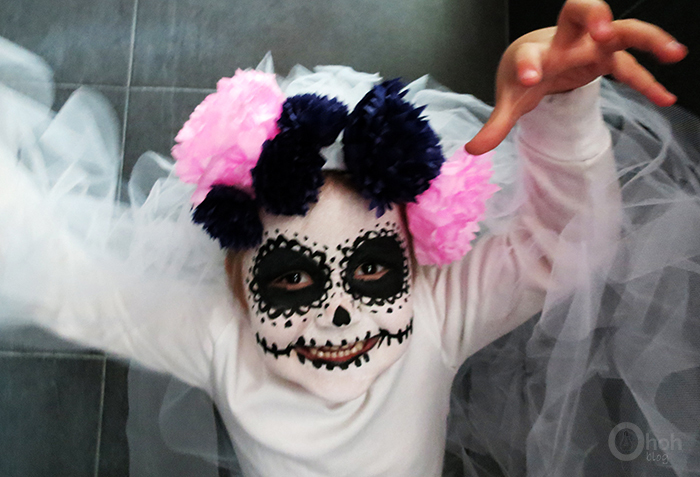 Both wanted to be “tumbas y tumbas” which mean in adult language a sugar skull costume. 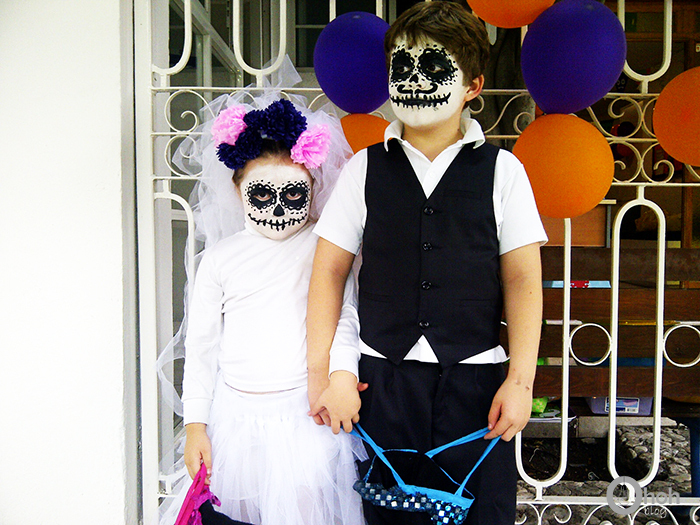 I propose them to make a bride and groom calavera costume, they agreed, we had a deal! For the groom costume, my son is gonna wear the suit we bought for my brother wedding (at least he will use it a second time!). 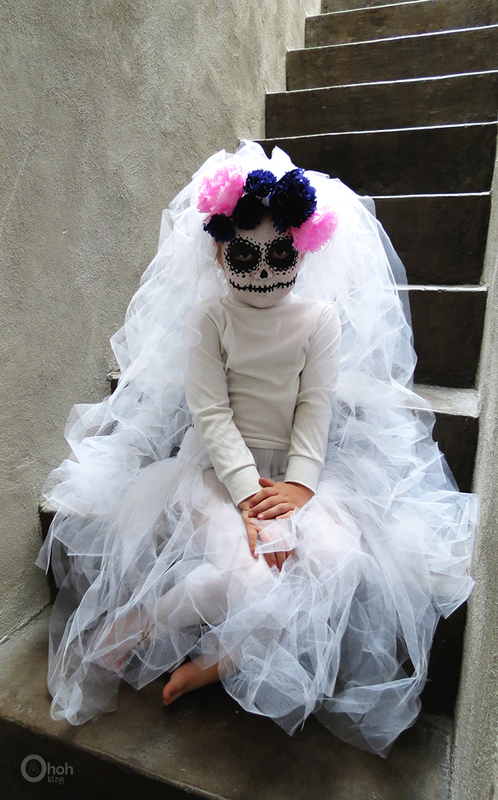 For my daughter I made an easy and no-sew bride costume with tulle. 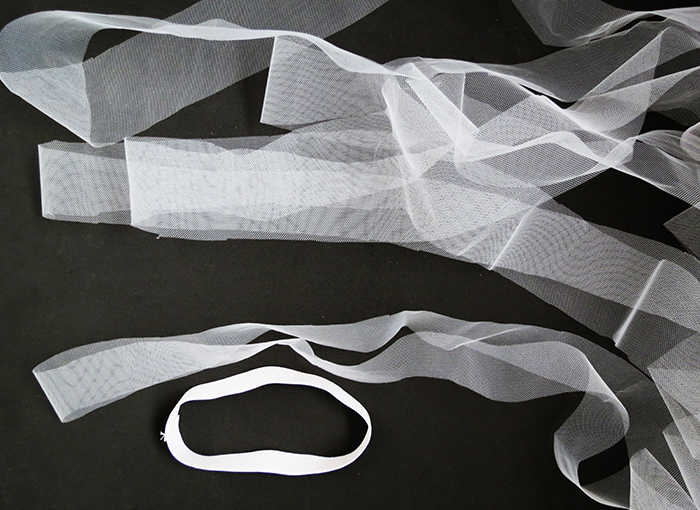 Let start making the bridal veil. Pass the 1″ wide rubber band around your kid head and cut at the dimension. Sew ends together to make a head band. Cut 2 yard of tulle fabric into 3 inches wide straps. Fold the strap in the middle and attach them with a loop around the head band. 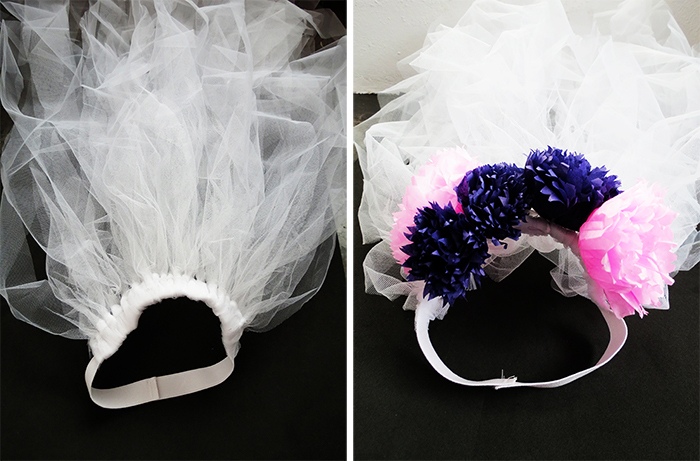 You need to have tulle on half of the head band. Then you can attach some flowers on it. You can use fake flowers, or you can make some with paper. I used purple and pink silk paper. I made the flowers the same way as paper pom poms. You can follow this tutorial, if you want to know how. You can make the bride skirt the same was as the veil. 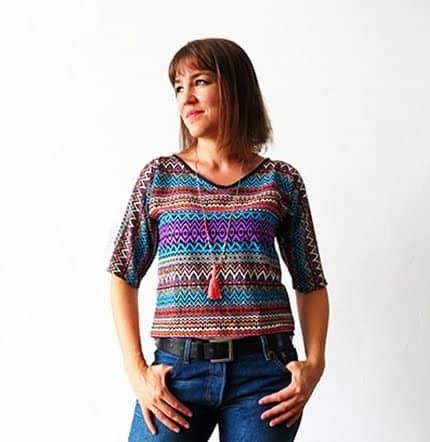 Just take a 2″ wide rubber band, cut it at the waist dimension and sew the ends together. You will need 5 yards of tulle to complete the skirt. 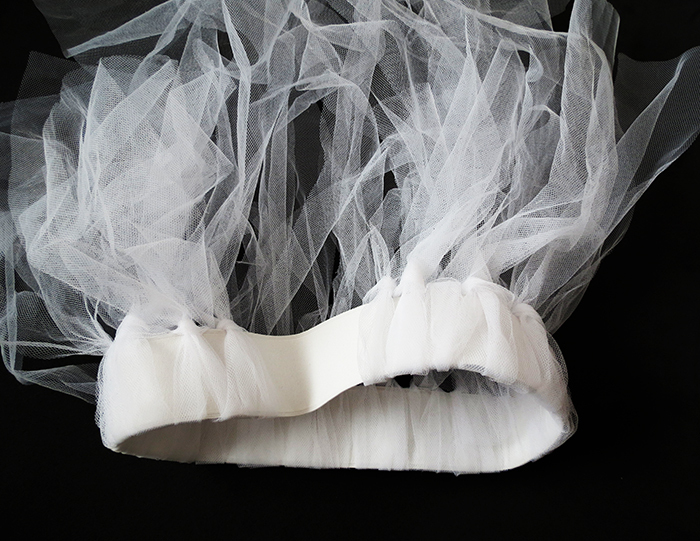 Cut the tulle on 3 inches strips, and attach them with a loop around the elastic. If you ever have made a tutu, it’s the same process. You can have a look at this awesome video for more explanations. To complete the costume, your girl will need a white legging and a white shirt. 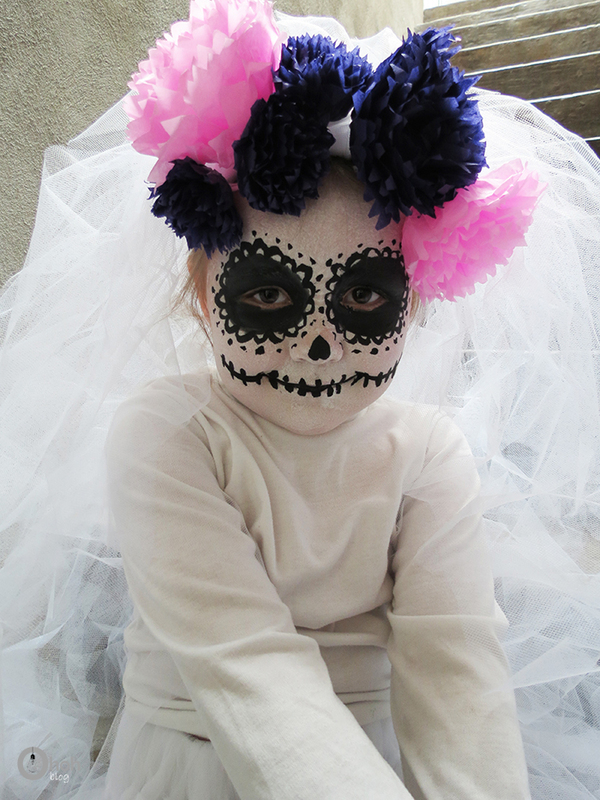 For the make up, I first painted her face in white with a sponge. Then I use a paint brush and draw two circles around her eyes, and fill them with black. I paint some dots and “flower petals” around them. I draw a upside down heart on her nose. I finished by drawing a big line for the mouth and add some small vertical lines to make the teeth. And tadaaaaam!!! We had fun making pictures! There is no way my son will put his costume on if he is not able to go out and ask for some candy…So I will share some more pics after Halloween night! 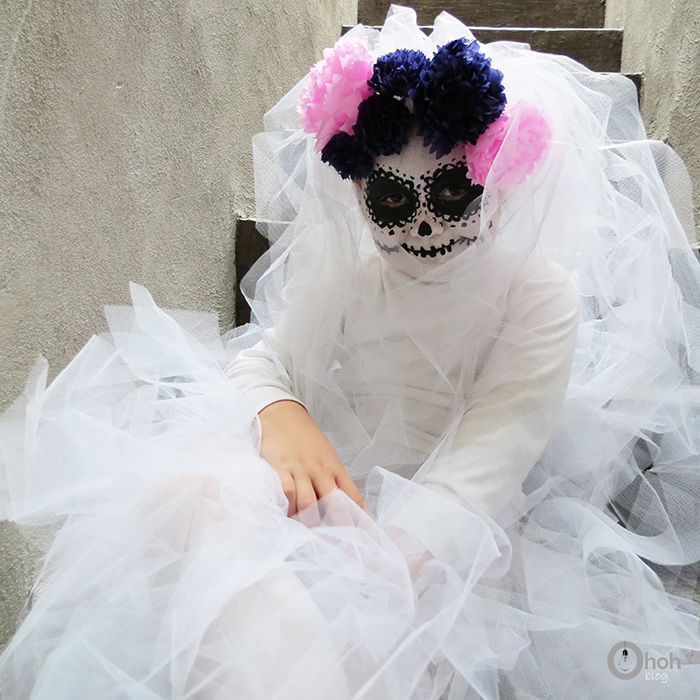 The calavera bride & groom together on Halloween day! Previous Post 5 DIY to try # How to upcycle a wooden box into a shelf. I LOVE it! That is such a great idea, and great finished product. 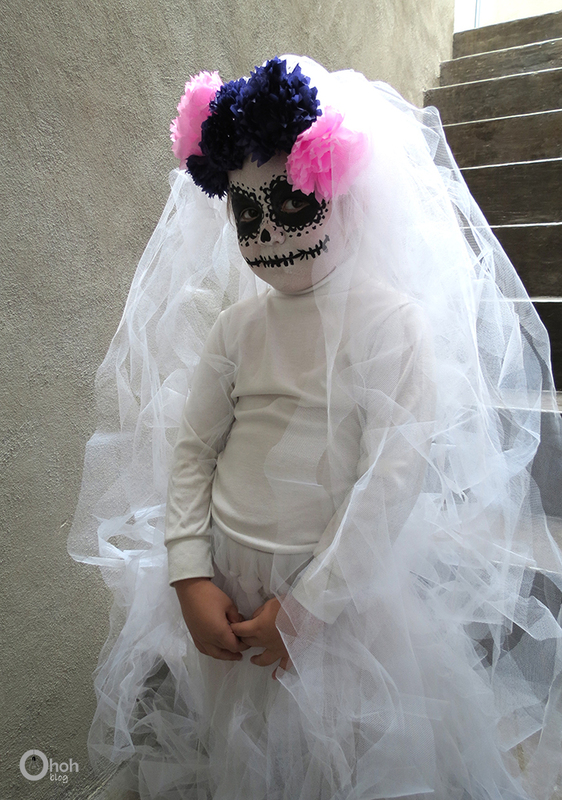 The bride is so adorable…I mean SCARY. 🙂 Can't wait to see photo of the groom! Thanks Kath! I will take some pics of the groom and bride together next week!